Sanford said their friendship "sparked" into something more "about a year ago"
COLUMBIA, South Carolina (CNN) -- South Carolina Gov. Mark Sanford visited Argentina exactly one year ago as part of a state-funded trade mission, according to a copy of the trip itinerary obtained by CNN. Sanford admitted Wednesday that he'd been having an extramarital affair with a Buenos Aires woman. 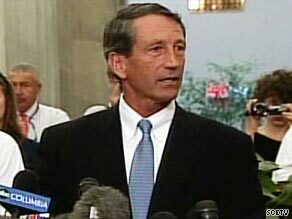 It's unknown whether Sanford spent time on the South Carolina Department of Commerce trip with the Buenos Aires woman. However, Sanford said the woman was a longtime friend he had known for eight years. He said the friendship "sparked" into something more "about a year ago." Sanford's office said the state-funded trip last year, like other trade missions, was organized by the Department of Commerce, not the governor. The following day, the group traveled to Buenos Aires -- the city Sanford went back to last week during a mysterious absence -- for the final two nights of the trip. Members of the delegation were scheduled to stay at the Hilton Buenos Aires, in the city's Puerto Madero district. While the delegation spent much of their time meeting with diplomats and business leaders, several hours each day were allotted for "personal time." The group returned to Columbia on the evening of June 28, 2008. According to state expenditure reports, Sanford's total expenses for out-of-state travel with the Department of Commerce were $21,487 for the fiscal year ending June 30, 2008. Governors commonly travel out-of-state or abroad to stir up investment in their home states. Sanford said in the news conference Wednesday that he footed the bill for his most recent trip to Buenos Aires, which occurred in the past week. The governor said earlier in the day he had traveled to Argentina before.